Treasury investors appear to be coming to grips with just how strong America’s economy is. The past week may be the one that blew the lid off yields in the world’s largest bond market, with the 10-year benchmark climbing the most in almost two years Wednesday and the selling pressure showing little sign of reversing since. 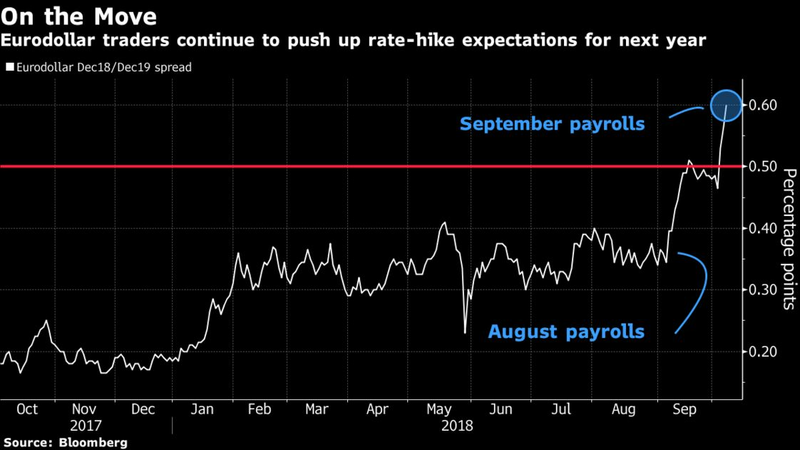 Traders are responding to a seemingly critical mass of evidence in favor of higher rates, including near-record service industry growth, and a 48-year low unemployment rate. The move comes at a crucial time, upending talk of recession that arose amid a two-year flattening of the yield curve and potentially reigniting the debate over inflation, which has been dormant since the financial crisis. If sustained, the market momentum will derail bets for a more dovish than forecast Federal Reserve, and may fuel expectations for more aggressive interest-rate hikes. Bond bears see plenty of reasons for the selloff to persist. Mike Schumacher, a rates strategist at Wells Fargo, said a lull in pension fund-related buying and easing concerns over Italy’s budget contributed to the initial move. He expects the prospect of record Treasury supply to keep the market under pressure. Pacific Investment Management Co.’s Mark Kiesel is among the few voices warning about mounting inflation, and he expects the 10-year yield to reach as high as 3.5 percent. “The U.S. economy is strong, deficits are going to increase and inflation risks are rising,” Kiesel said. The bond market faces a key test with the coming week’s Consumer Price Index report, which will indicate whether rising wages are translating into more widespread price pressures. 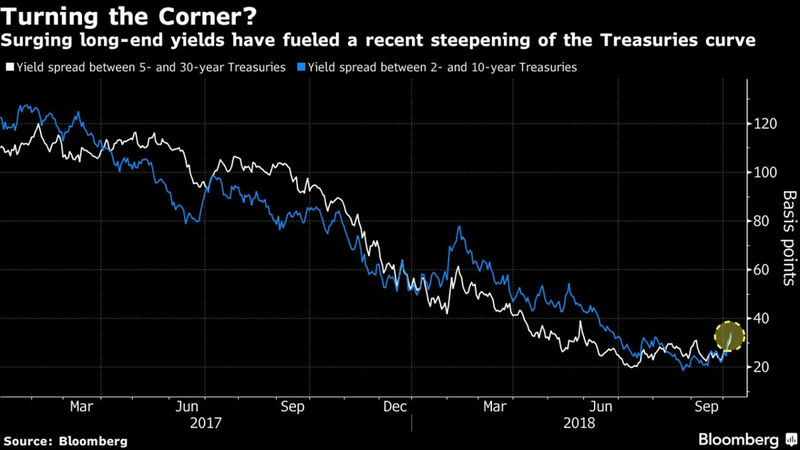 The prospect of higher inflation could also drive a continued steepening of the yield curve, which this year reached its flattest point since 2007. In addition, an acceleration in prices would likely force a further upward recalibration of Fed rate hike expectations in the eurodollar market, in which traders over the past month have priced an additional 25 basis points of tightening in 2019. That said, the concerns that many investors appear to have cast aside haven’t gone away. Escalating trade disputes, volatility in developing nations and weakening global growth, which have hounded the market for the better part of the year, are still lurking in the background. And economy watchers, including the rate setters at the Fed, have highlighted that the current U.S. growth boom is likely to prove temporary. Before Fed Chairman Jerome Powell was heaping praise on the state of the economy, he had warned that the benefits of recent fiscal stimulus are almost certain to subside. It’s that sense of caution that may well keep the Fed’s tightening path a gradual one. “Powell is moving in a patient and pragmatic way,” said Matt Toms, chief investment officer of fixed income at Voya Investment Management, which oversees $209 billion in total assets. “It’s not inflation spiking for the bond market, it’s about a Fed that will be patient enough to let the 10-year yield lead the way higher. That will allow the market to steepen,” he said, referring to the gap between 2- and 10-year yields. Toms, who reckons longer-dated securities will underperform, sees value in the 10-year yield around 3.25 percent this year, and the rate rising to around 3.50 percent next year. He’s not the only one. Treasury-options traders are increasingly seeking protection against a run-up in yields through year-end. A buyer of put options ponied up $2.5 million for a hedge against a rise in 10-year yields to 3.6 percent Thursday, with the wager expiring two days after December’s Fed meeting. With the Treasury market becoming increasingly volatile, investors are more at risk than ever of being caught off guard. Credit Agricole analysts have spiked their long call from the end of September. Their peers in the bullish camp will be watching for any signs of the status quo returning when China’s markets reopen after a week’s holiday.